Pugneys Country Park01924 302360work Country ParkTake a stroll along the lakeside path, take a ride on the Pugneys Light Railway (available on selected weekends – www.pugneyslightrailway.co.uk) or make the short walk up the hill to Sandal Castle and see how picturesque the country park looks from above. 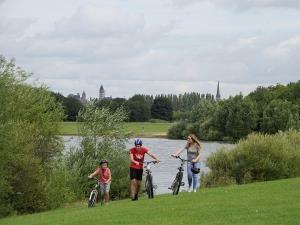 Explore the country park on two wheels, bring your own or hire one for the day. The whole family can get involved with child trailers available for the little ones. Take a stroll along the lakeside path, take a ride on the Pugneys Light Railway (available on selected weekends – www.pugneyslightrailway.co.uk) or make the short walk up the hill to Sandal Castle and see how picturesque the country park looks from above. Parking charges apply all year round, seven days a week. Electric mobility hire @ £1.60 for an hour and a half.